The Quick Inventory of Depressive Symptomatology is a short screening tool based on the larger Inventory of Depressive Symptomatology (IDS). It is a self-report tool designed to screen for depression and measure changes in severity of symptoms. It assesses all the main criteria for Major Depressive Disorder in the Diagnostic and Statistical Manual of Mental Disorders - 4th edition (DSM-IV). It does not assess melancholoic or atypical depressive symptoms. , :1 There are 16 questions, based on how you have been feeling in the last 7 days. These questions have been designed for adults rather than children or adolescents. A printable version can also be downloaded. Translations are also available in many different languages. This self-assessment tool is not a substitute for clinical diagnosis or advice. By using the tool you agree to accept that the website's owner and contributors are not responsible or liable for the outcome of the tool, the accuracy of the calculations, or any decisions or events which result from using it. You can use the feedback form to report any mistake. This website does not provide medical advice. PLEASE CHECKMARK THE ONE RESPONSE TO EACH ITEM THAT IS MOST APPROPRIATE TO HOW YOU HAVE BEEN FEELING OVER THE PAST 7 DAYS. I never took longer than 30 minutes to fall asleep. I took at least 30 minutes to fall asleep, less than half the time (3 days or less out of the past 7 days). I took at least 30 minutes to fall asleep, more than half the time (4 days or more out of the past 7 days). I took more than 60 minutes to fall asleep, more than half the time (4 days or more out of the past 7 days). I didn’t wake up at night. I had a restless, light sleep, briefly waking up a few times each night. I woke up at least once a night, but I got back to sleep easily. I woke up more than once a night and stayed awake for 20 minutes or more, more than half the time (4 days or more out of the past 7 days). Most of the time, I woke up no more than 30 minutes before my scheduled time. More than half the time (4 days or more out of the past 7 days), I woke up more than 30 minutes before my scheduled time. I almost always woke up at least one hour or so before my scheduled time, but I got back to sleep eventually. I woke up at least one hour before my scheduled time, and couldn’t get back to sleep. I slept no longer than 7-8 hours/night, without napping during the day. I slept no longer than 10 hours in a 24-hour period including naps. I slept no longer than 12 hours in a 24-hour period including naps. I slept longer than 12 hours in a 24-hour period including naps. I felt sad less than half the time (3 days or less out of the past 7 days). I felt sad more than half the time (4 days or more out of the past 7 days). I felt sad nearly all of the time. There was no change in my usual appetite. I ate somewhat less often or smaller amounts of food than usual. I ate much less than usual and only by forcing myself to eat. I rarely ate within a 24-hour period, and only by really forcing myself to eat or when others persuaded me to eat. I felt a need to eat more frequently than usual. I regularly ate more often and/or greater amounts of food than usual. I felt driven to overeat both at mealtime and between meals. My weight has not changed. I feel as if I’ve had a slight weight loss. I’ve lost 2 pounds (about 1 kilo) or more. I’ve lost 5 pounds (about 2 kilos) or more. I feel as if I’ve had a slight weight gain. I’ve gained 2 pounds (about 1 kilo) or more. I’ve gained 5 pounds (about 2 kilos) or more. There was no change in my usual ability to concentrate or make decisions. I occasionally felt indecisive or found that my attention wandered. Most of the time, I found it hard to focus or to make decisions. I couldn’t concentrate well enough to read or I couldn’t make even minor decisions. I saw myself as equally worthwhile and deserving as other people. I put the blame on myself more than usual. For the most part, I believed that I caused problems for others. I thought almost constantly about major and minor defects in myself. I didn’t think of suicide or death. I felt that life was empty or wondered if it was worth living. I thought of suicide or death several times for several minutes over the past 7 days. I thought of suicide or death several times a day in some detail, or I made specific plans for suicide or actually tried to take my life. There was no change from usual in how interested I was in other people or activities. I noticed that I was less interested in other people or activities. I found I had interest in only one or two of the activities I used to do. I had virtually no interest in the activities I used to do. There was no change in my usual level of energy. I got tired more easily than usual. I had to make a big effort to start or finish my usual daily activities (for example: shopping, homework, cooking or going to work). I really couldn’t carry out most of my usual daily activities because I just didn't have the energy. I thought, spoke, and moved at my usual pace. I found that my thinking was more sluggish than usual or my voice sounded dull or flat. It took me several seconds to respond to most questions and I was sure my thinking was more sluggish than usual. I was often unable to respond to questions without forcing myself. I was often fidgety, wringing my hands, or needed to change my sitting position. I had sudden urges to move about and was quite restless. At times, I was unable to stay seated and needed to pace around. Press Calculate Result to see your score. Each question is scored from 0 (symptom not present) up to 3 (most severe symptom). Only 9 answered are scored. The score is worked out by adding up the highest score from questions 1-4 (sleep items), question 5, the highest score from questions 6-9 (appetite/weight items), questions 10, 11, 12, 13, 14 and the highest score on either question 15 or 16 (psychomotor items). The maximum score is 27. Press the Clear button to remove the results from your screen after using the tool. University of Pittsburgh Department of Epidemiology. (n.d.). 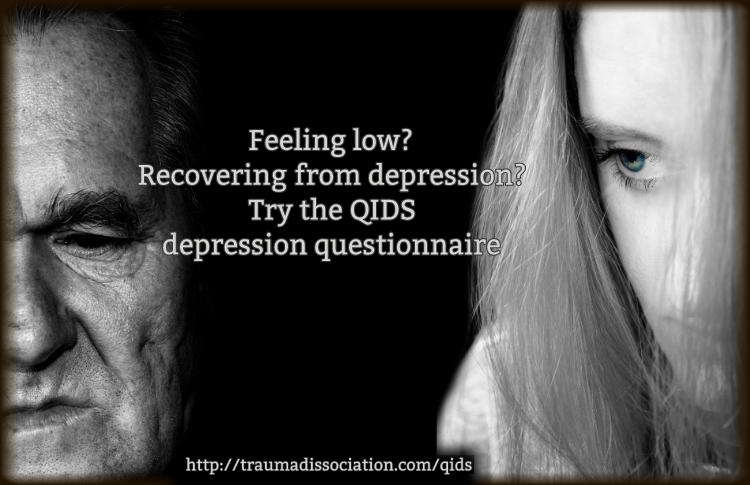 Inventory of Depressive Symptomatology (IDS) & Quick Inventory of Depressive Symptomatology (QIDS). Retrieved July 2, 2015. Rush A.J., Trivedi M.H. , Ibrahim H.M., Carmody T.J., Arnow B., Klein D.N., Markowitz J.C., Ninan P.T., Kornstein S., Manber R., Thase M.E., Kocsis J.H., Keller M.B. (2003). The 16-item Quick Inventory of Depressive Symptomatology (QIDS) Clinician Rating (QIDS-C) and Self-Report (QIDS-SR): A psychometric evaluation in patients with chronic major depression. Biological Psychiatry, 54(5), 573–583. doi:10.1016/s0006-3223(02)01866-8. PMID: 12946886. Lamoureux, B. E., Linardatos, E., Fresco, D. M., Bartko, D., Logue, E., & Milo, L. (2010). Using the QIDS-SR16 to Identify Major Depressive Disorder in Primary Care Medical Patients. Behavior Therapy, 41(3), 423–431. doi:10.1016/j.beth.2009.12.002. PMID: 20569790. American Psychiatric Association. (2000) Diagnostic and Statistical Manual of Mental Disorders, Fourth Edition, Text Revision. (DSM-IV-TR). Halverson, J. L., Bhalla, R. N., Andrew, L. B., Moraille-Bhalla, P., Leonard, R. C. (2015, May 7). Depression Differential Diagnoses. Retrieved July 4, 2015. Quick Inventory of Depressive Symptomatology. Traumadissociation.com, Retrieved from .